A treasure haul salvaged from a sunken Spanish galleon sunk by British warships in 1804 was unveiled today. The loot was found in the wreck of Nuestra Senora de las Mercedes and had been at the centre of a five-year legal battle between a U.S. salvage company and Spain. US firm Odyssey Marine Exploration found the lost treasure off Portugal's Atlantic coast in 2007. At the time, the treasure was estimated to be worth $500m (£316m). But a US federal judge recently ordered Odyssey to give Spain access to the treasure, the last in a series of legal defeats for the salvage firm. Only a tiny portion of the haul from the galleon that sank off Portugal's Atlantic coast near the straits of Gibraltar was shown to the media - 12 individual silver coins, a block of encrusted silver coins stuck together after centuries underwater, two gold tobacco boxes and a bronze pulley. 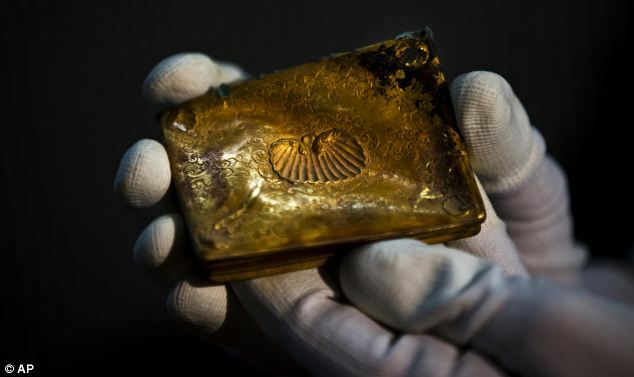 Authorities who have been inventorying the treasure since it was flown from Florida to Spain in February said it will be transferred later this year from Madrid to the National Museum of Underwater Archaeology in the Mediterranean city of Cartagena.